I have lots of free backing papers I’ve received in magazines. Sometimes they can be pretty poor quality – pretty, but still just thin shiny magazine paper. But occasionally you get some that are just as good any anything you can buy in the shops. Here are a couple of cards I’ve made with some of those excellent quality papers. 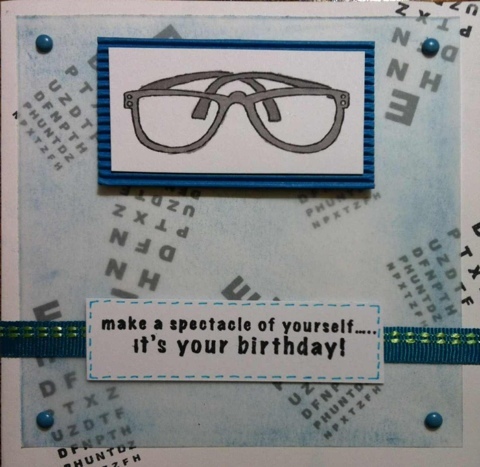 Both of these cards use the same backing paper, but I’ve used different toppers to create to quite different cards. Although I have just noticed that i’ve used the term ‘Just For You’ on both of them, quite by accident! I think the birthday cake topper was a die-cut I received in a bag of randomness either in a swap, or an eBay package when I first started out crafting. Either way, when I got it, it was pretty uninspirational as it was cut from plain cream cardstock. However, by choosing marker pens to match the backing paper colours I have managed to make it look much more fun. 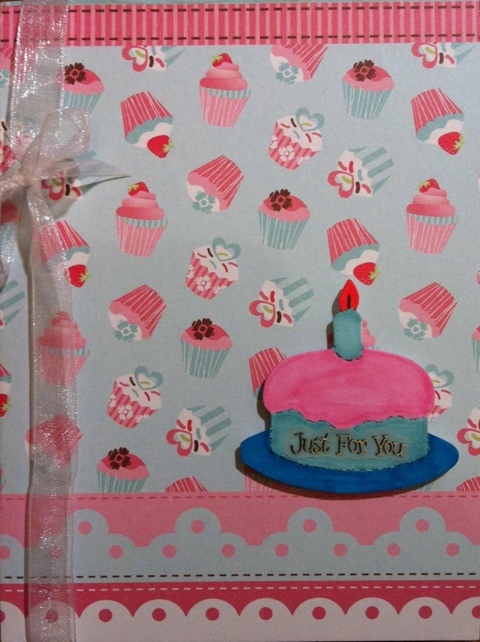 Some plain white organza ribbon wrapped around the card adds interest, and a vellum sticker sentiment finishes it off. 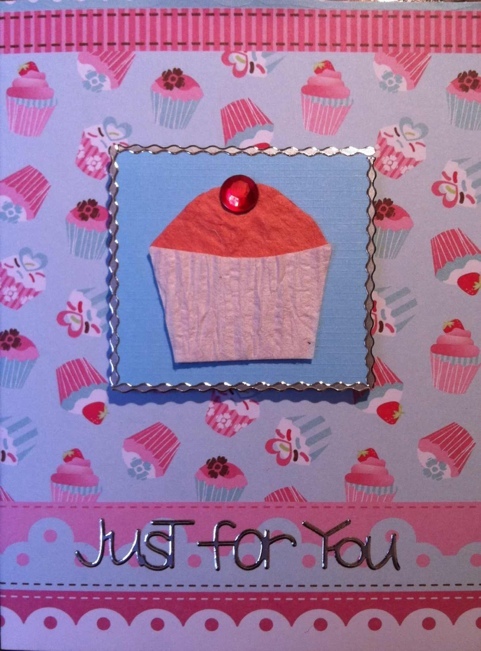 I had cupcake backing paper left over after making the above card, but no more birthday cake toppers. So I decided to make my own topper. I used white textured paper for the cake case, pink handmade paper for the cake, and I coloured a white adhesive gem red using a marker pen to make the cherry on top. I stuck my cupcake to some pale blue cardstock, and accented it with a silver peel-off border. I love the font of the ‘Just For You’ peel off, it looks so fun! Two of my friends recently celebrated some very important days. At the beginning of September my friend Michelle and her husband celebrated 10 years of marriage. And just a few days later, another good friend Stacey got married. 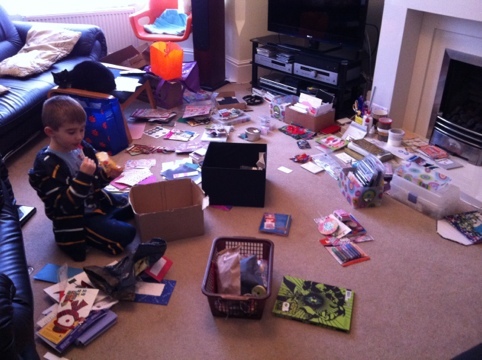 I have to admit, I did feel somewhat under pressure to produce two cards in quick succession for such important events! 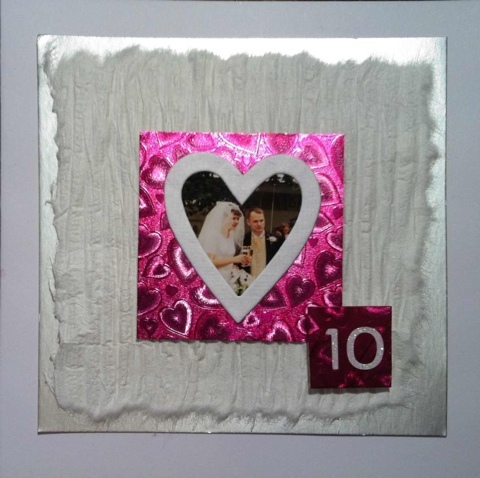 When it comes to important wedding anniversaries, I love to personalise the card as much as I can. And what better way than to incorporate a wedding day picture?! I went through my pile of photos from that day (and it tells you a lot about me that the photos are still in a pile after 10 years, and haven’t made it into an album yet!) and found a nice photo of the two of them, that fitted perfectly inside the paper heart frame that I was wanting to use. The pink heart backing card (called Dufex) was a small scrap that I hadn’t thrown away, but was just the right size to use. Originally plain silver, I found a marker pen that matched (almost) the colours of the bridesmaid dresses on the day, and coloured it in. I did the same with the tiny square I put the number stickers on too. A torn layer of textured white paper on top of a layer of matt-finish silver cardstock all added to the matting & layering effect I wanted to acheive with this card. This was such a hard card to make! I was so proud of the acceptance card that I’d given her that I really didn’t know how to top it! I knew that I wanted to stick with her wedding theme colour of green, so that was my starting point. 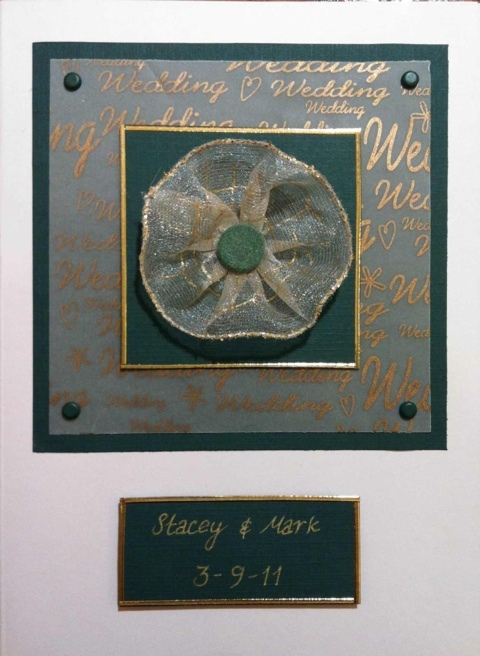 I discovered in the depths of my craft drawer a piece of vellum, with ‘wedding’ written over it in gold writing, so I chose to mount that on some green cardstock using matching green brads in each corner. So with the colours of green and gold chosen, I set out to see what else I had that would match. I’d recently bought some gorgeous gold organza ribbon from my local craft shop, Tutbury Crafts. I’d planned to use it on Christmas cards, but it just seemed to fit perfectly with this wedding card. I made it into a ribbon flower and mounted it on some more green cardstock using a green flocked brad, and put a gold peel-off border around the edge of the card. Finally I personalised it with the happy couple’s name, and the date they tied the knot (which I must’ve checked about 6 times before I finally wrote it!). I’m probably not as pleased with this card as I was the acceptance one, but that may be because I don’t usually ‘do’ gold and I’m more used to silvery cards. Regardless, I hope it’s one that they’ll keep for many many years. I was sorting out some bits and pieces recently when I came across an old diary, which contained a section of maps at the back. 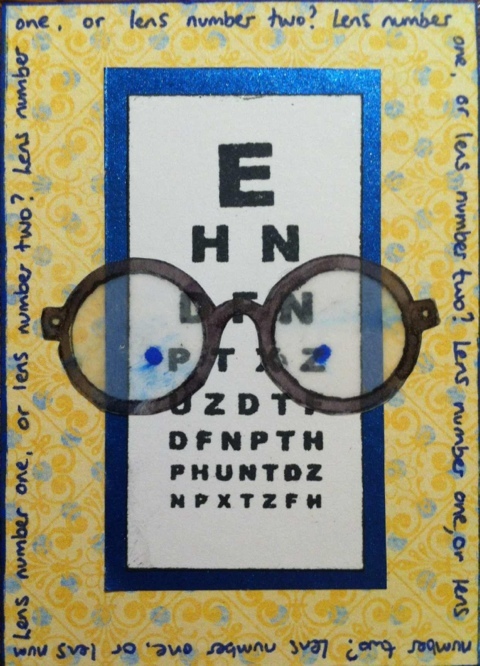 Rather than throw the whole lot away I thought ‘I bet I can do something with those!’ and used them to make the following ATCs. I discovered that the overview map of the UK from the diary was just the right size to fit perfectly on an ATC, so I cut it out to use as a backing paper. 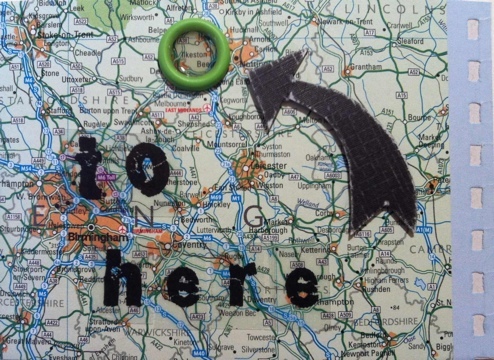 I then cut strips from another, more close-up map and glued them over the top. 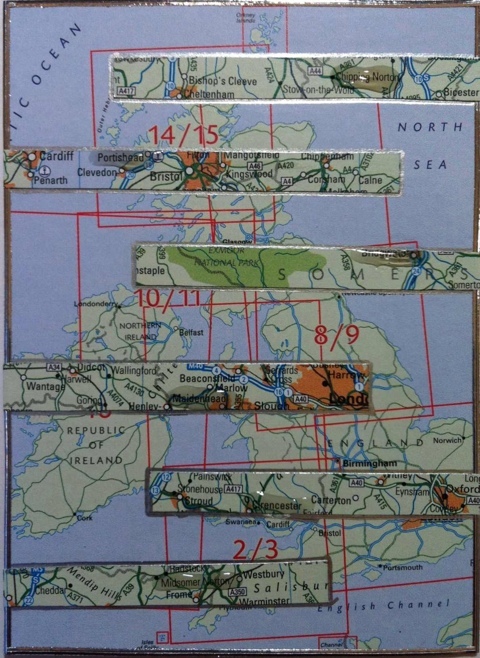 I outlined the ATC using silver peel-off borders, and outlined each map strip in silver pen. Finally, using Anita’s 3D Clear Gloss Finish I highlighted one area name on each strip. 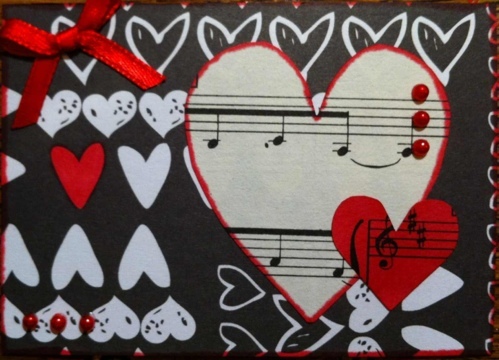 It was a very simple ATC to make, but I think it works really nicely. I can’t wait to send it to someone overseas! These two ATCs comprise my first ever ‘series’ as they are basically the same. 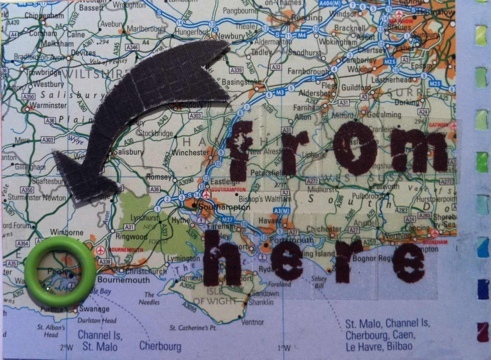 ‘From here’ shows my place of birth circled with a Hugz circle embellishment (like a big circular brad). 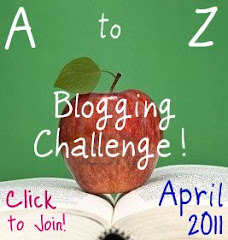 I drew and cut out the big arrow by hand, and used some fab vellum letter stickers for the words. ‘To here’ is pretty much the same, but shows where I live now. I really like these. Because they’re so personal though I might not swap them, and keep them for my own collection instead. Vellum for crafting is translucent paper, available in many colours and designs. It can be used over the back of an aperture card to allow light through, or it can overlay other, brighter papers, muting the tones. 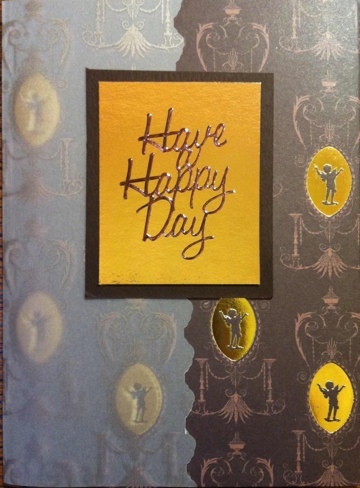 Here is an example of a card I’ve made using vellum overlaying a matching backing paper. Vellum can be tricky to stick to the background as it is semi-transparent, and glues and tapes can often be seen through it. I have cheated a little on the above card by wrapping the paper and vellum around the spine of the card, and using tape to attach it to the back, so it’s not visible from the front. 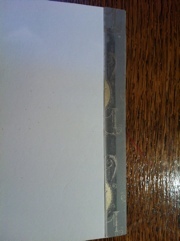 As you can see, the tape is clearly visible through the vellum. My preferred method of attaching vellum is with my long time favourite, brads. 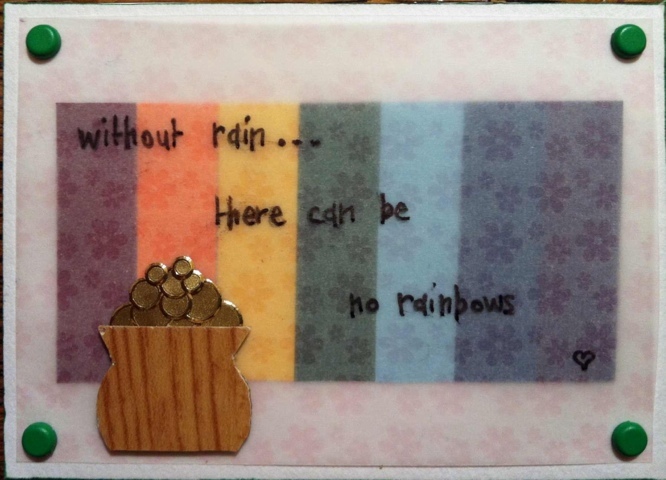 Below is an ATC I made using lightly patterned vellum overlaying a rainbow of coloured card, and journalled with yet another font from my Scrapbooker’s Handwriting Workshop. Incidentally, the little pot was made using a piece of kitchen worktop sample (there’s a reason I keep all manner of rubbish)!